So as a news producer occassionaly in my never ending quest for news content I discover a gold mine. A nugget that informs, entertains and even astounds. The Corn Dog Felon... oh so good. This man on his lunch break goes to a get some corn dogs. When his order comes up, he takes the corn dogs but doesn't pay. Well when he gets back to work from his lunch break, the police show up. See, he was wearing a work shirt with the name of the company he worked for on it. The officers went to arrest him and a coworker offered to pay the $5 for the corndogs. Yes, just $5. Our stupid criminal pocketed the money instead and said he wasn't going to pay for the corn dogs. Too bad, it was his third crime, so he was arrested for felony corn dog theft. 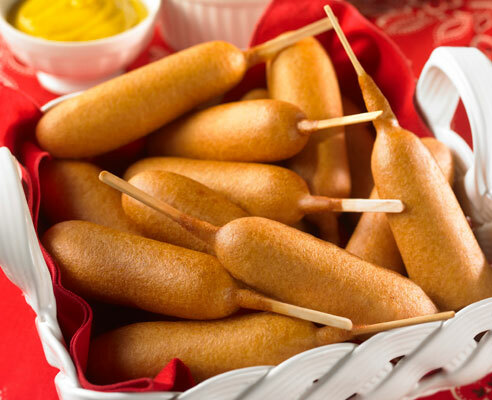 I hope they were good corn dogs because who knows what that jail food tastes like. On second thought, the genius must, after all he'd been there before. first to react to this after randomly searching for "stupid corn dog." Don't ask why.